JUST THREE SHORT YEARS AGO, Raphael Nowak was a high-school senior in his hometown of Kelowna, BC. Fast forward to 2016 and his third year in the Freshwater Science program at UBC Okanagan: Nowak has a resumé of experience, service, accomplishments and awards that reads like it belongs to someone with decades, not years, of accomplishments. Why Freshwater Science? Nowak grew up on the shores of Okanagan Lake, which captivated him his entire life. 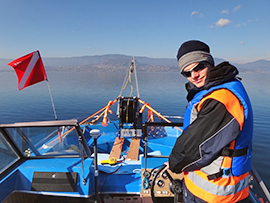 While in middle school, the self-described inventor and innovator began independent research and exploration of Okanagan Lake, constructing sophisticated equipment such as sonar and ROV’s (remote operated vehicles), and using underwater cameras to probe depths of up to 1,000 feet (more than 300 metres). 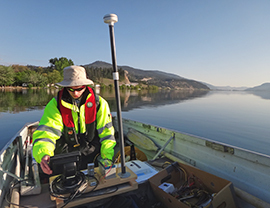 “While Okanagan Lake is fairly well-studied, very little is actually known about the geology and biology deep within the lake,” he says. Nowak’s research has led to contact with numerous professionals in the community and contract work for consulting companies and government agencies. His work has also been used by non-profits such as the Okanagan Science Centre and the Okanagan Basin Water Board, and has been featured by local TV stations. In Grade 10, Nowak’s passion for Okanagan Lake came to the attention of UBC Okanagan Professor of Biology Ian Walker. Nowak contacted him for help identifying a mysterious aquatic plant he collected from the lake. Walker was so impressed with the high-school student that he encouraged the budding researcher and scholar to apply to the Freshwater Science Program. Nowak took the advice seriously and soon Walker became one of his favourite professors, along with Jeff Curtis in the Earth and Environmental Sciences department. “Dr. Curtis has helped me improve my analytical and critical outlook of scientific environmental work,” says Nowak, who has now taken three courses with the associate professor. Nowak says one of the best parts of the programs offered through Earth and Environmental Sciences are the courses with field trip components. During his field studies, Nowak examined flora and fauna in one of Walker’s courses, visited the Kelowna Wastewater Treatment Facility with Curtis as part of his freshwater resources issues and management class, and conducted stream gauging at Bear Creek with Geography professor Fes de Scally during a hydrology course. 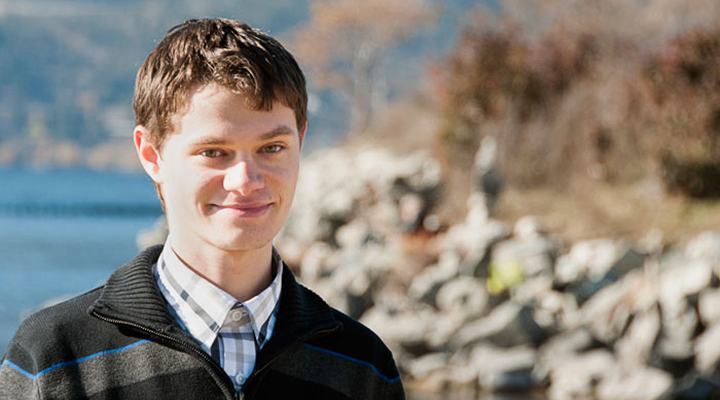 In addition to coursework and his robust independent research, Nowak has also taken advantage of institutional research opportunities, working in the Computational Fluid Dynamics Lab on a project modelling creek water dispersal into Wood Lake, and assisting with a graduate research project studying thermal patterns in Wood Lake that can contribute to fish kills. Nowak feels lucky to have a top-tier university with a freshwater science program in his hometown. But one gets the feeling that luck has never been something the outstanding student relies on—his natural curiosity, drive and initiative have carried Nowak to places it takes most academics and professionals years to reach. He is currently working on a book that documents scientific and historical aspects of Okanagan Lake, which includes his underwater studies, discoveries and observations. Nowak’s fascination for freshwater exceeds academia and is the focus of much (though not all) of the thousands of hours of volunteering he has done. He is a founding member of the non-profit Legacy Water Search & Recovery Society, which specializes in using innovative technology to search for and recover drowning victims in British Columbia. “It is a humbling experience to respond to such tragic cases on our lakes. However, it is incredibly rewarding to be able to offer some closure to grieving families by letting them know that you are there to help bring their loved one home,” he says. 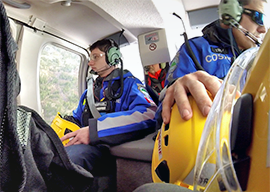 Nowak is also a specialist member for underwater drowning searches and recoveries with Central Okanagan Search and Rescue, and is a certified Ground Search & Rescue technician, assisting with medical rescues and backcountry emergencies. He also volunteers with the Regional District of Central Okanagan Emergency, assisting with setting up emergency reception centres during wildfires; he’s also a qualified radio communications volunteer. He is also active with the Okanagan Historical Society and has volunteered at Kelowna General Hospital for over five years. “It has often been stressful to balance academic and extracurricular life, but I find volunteering allows me to relax a little and shift my mind to other topics,” Nowak says.